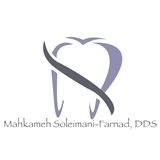 Mahkameh Soleimani-Farnad (Beverly Hills) - Book Appointment Online! Dr. Soleimani-Farnad was exceptional. She made me feel safe and at ease despite having WAY more cavities than I expected. My procedure was completely painless due to her gentle treatment. I highly recommend seeing her.